This side will have a 4' ramp to the basement and a mudroom. Someday, the mudroom will lead to a garage that will attach to it. Standing in the back, looking towards the front. They are framing the octagonal section ~ this will be the kitchen area. Standing over the kitchen area looking towards the back. Wanted to jump on the puter and post what was done this weekend. I took these pics using Mike's super duper wide angle lens. We are pretty excited about it. We were approved for our building permit today and the footers will be poured on Friday. Hopefully we'll be "throwin logs" in three to five weeks. We got home about 7:00pm last night and it's been a VERY hectic day. I had lots of phone calls to make and some catching up to do. Our HP laptop computer (only 5 months old) crashed and is dead dead deadsky. I feel sick over it ... everything was on there ... all our pictures ... just everything. I hope there is a way to get it all back ... we can't even turn the thing on. I'm not sure how much stuff is saved on our little "stick". Matthew had a GI doctor appointment; it went very well. We're going to try a drug to increase his appetite. I received some upsetting news from my 25 year old son. He found out today that he has some kind of heart defect. *very sad face* Apparently he's been feeling dizzy, experiencing some chest pain and a rapid heart rate. I am waiting to speak w/ Matthew's cardiologist; hoping to hear that it's all going to be okay. Casey said they will try to control w/ meds ... but it may require a surgery ~ good thing, it won't require cracking his chest open ... can by done thru a catheter. Problem has to do with a portion of his heart being too thick, it interferes w/ impulses and cause heart to misfire. *big sigh* I feel awful about it. I now have two kiddo's w/ a heart defect ~ wow. I'm feeling all kinds of guilty... I know I'm not supposed to ... but I do in a "mom sort of way". I promise, I will be around to visit your blog soon! I miss everyone! I need to see what you all are up to and I think of you guys often, isn't that funny! I'm using Mikey's old computer for the time being. 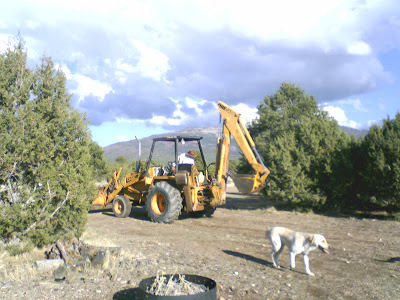 Mike clearing out a few junipers, in preparation for the basement dig. Our neighbors dog, Amy is helping out. Pics are from a cell phone, not bad, huh! 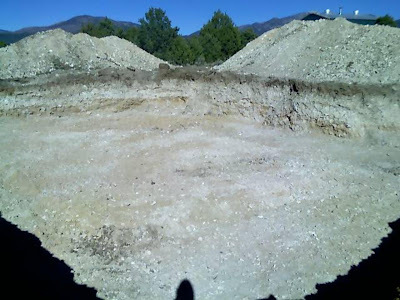 This is a 6' deep hole ~ it doesn't look like it, but it is. 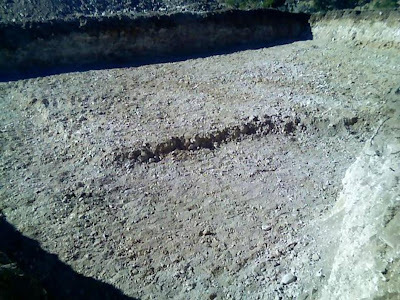 It took only 6 1/2 hours to excavate, I was surprised, I thought it would take a day or two! My neighbor Tanji took the pics for us. Our green steel barn (that Mike built) is behind that heap on the right. Apparently there are four huge heaps. We will now need to have the concrete pumped in ......too bad.... we were trying to avoid that... it's going to be an additional $1500. I am preparing myself for lots of extra "somethings" to pay for. Everything seems to be costing more than we had expected. I am standing where our sink will be. The kitchen is octagonal and will face Beaver Mountain. We are up on a hill ... a little behind and to the left of me will be the dining room w/ french doors... a deck will wrap all the way around the back. The deck outside the dining room will actually be over the side of the hill. The back side of the house is pretty close to the edge of the hill ... and that will overlook farmland w/ cows, horses and sheep. Our family room will be directly behind the kitchen. The first floor will be between 24 and 30 inches off the ground, so we will have a million dollar view. We are going to go with radiant floor heating instead of standard heating. Mike has already read most of the radiant floor heating book and has an agreement w/the plumber to help do a lot of it. That should save us quite a bit of $$. We hear radiant floor heating is the way to go! our final cabin plans came in late Friday afternoon. By Friday night.. the concrete guy had his plans. Touched base w/ the excavator, the rough plumber and the radiant floor guy. By Saturday morning ... we had three sets of plans to pass out for bids and for the building inspector. We ran up to Beaver on Sunday morning so we could meet the concrete guy on Monday~ to stake out the site. Turned in our application, permits and plan to the building inspector. So, if all keeps going smoothly... we should be throwing logs in about a month. It's just too dang bad we have to do this in the winter ... we should have been doing this in June. Mike is very excited... we need to take advantage of his 3 days off every week. Good thing about winter... people are less busy and more hungry for work. I'll be back w/ some pictures. I took about 35. I spent a good portion of the day today on the phone with Apria Home Health care (and my insurance company) re: the $2443 a month payment on Matthew's feeding supplies. I was originally told, "That's what the agreement is with your insurance company". I asked for the supervisor name and number ... called her and left a lengthy message questioning the price difference. not $2443. They need to credit our insurance about $1593. for each month of the over billing. The cardiologist said there has been no narrowing ... and the leak is the same as before. That is fantastic news! We'll go back for another ECHO in six months. He said when Matthew goes in for surgery, it will be because of the leak and not the narrowing. He mentioned that conduits can get some kind of sludge build up. They rate the leak 1 to 10, and his leak is still a 3. Doctor said that he'll need a conduit change once it is between 8 and 10; he said to plan on surgery in about 2 years. We'd been told at Stanford, that on average, these little guys need a conduit change every three years. So, that would be about right. Now, the whiny mother part of me wishes that he was just fixed and we didn't need more surgeries ever again. We hope medical technology will advance quickly, so that he won't need to go in (approximately) every 3 years .... maybe they will come up with some new kind of tissue or a bovine or pig valve that will last longer. Oh yeah, we tried to go celebrate at IHOP afterwards, but Matthew pitched a HUGE fit as we were sitting down. We got up and left the building. He screamed all the way home! We didn't know what the heck was going on. He's been a perfect angel since we walked in the door. 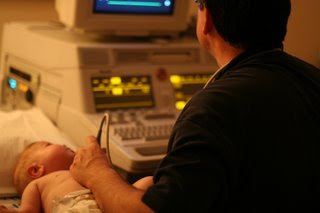 Slideshow below of Matthew getting his EKG and ECHO at Dr. Gary Mayman's office. Matthew's ECHO & EKG tomorrow morning. Please pray for no changes in that leaky valve (his pulmonary artery is made of cadaver tissue) and no narrowing of his pulmonary branches. Those are our two main concerns. I will update when I get home. This was last year ~ he was checking it out. I'll try to get a picture tomorrow. The hard part will be to keep him calm and quiet. The ECHO & EKG in April was a little difficult ~ he was crying his head off and squirming all over. I'll be bringing a bottle of bubbles to distract him.